The Starlingear Stealth design has been a favorite since its inception with its subtle sinister look. Ryk was inspired by the famous "The Great Wave off Kanagawa" woodblock printing. He carved the great crashing wave into the Stealth for a cool textured look. Super cool two tone look with vivid colors on the body with bright natural Ti highlights! About Titanium Starlingear: If you notice, most titanium jewelry is machined and not cast with Starlingear detail. 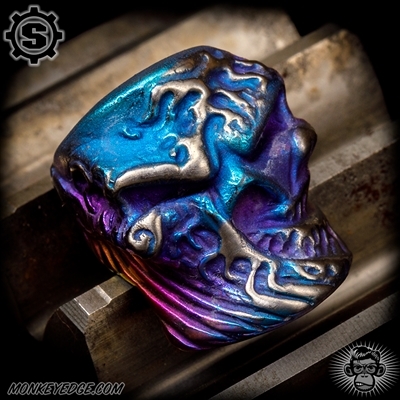 Titanium is an incredibly hard material to cast. For a comparison: silver melts at about 1763 degrees F, while titanium has to get up over 3000 degrees F! In addition, there is a very high loss rate with the titanium as the metal does not flow into the mold as easily. Almost changes color depending on light.